CapacityIQ adds an advanced reporting element to vCenter Server. By installing this capacity planning tool, you can capacity-plan for infrastructure expansion and control VM sprawl. The installation and configuration requires you to download the appliance and set up the storage and networking. When linking CapacityIQ to vCenter Server, you'll designate which hosts and virtual machines should be analyzed by adjusting vCenter Server permissions. First, download the CapacityIQ appliance from VMware's website, unzip the file and extract the contents. It consists of five files, including Open Virtualization Format (OVF) and Virtual Machine Disk files. Next, in vCenter Server, select File, then Deploy OVF Template. Once the wizard launches, select the extracted OVF file, then choose a name and location (i.e., cluster, host and data store) for the virtual machine (VM). In the next screen, choose a network for the capacity planning tool. The network must have access to the vCenter Server. Next, power on the appliance and launch the VM console. It will prompt you to set a password for the root account, which you won't generally use. (All administrative actions can be preformed from the Web interface. The root account provides access to the appliance's local Linux OS, which you won't typically need after the initial setup.) At the next prompt, set a password for the ciqadmin user account, which is the administrative account for the CapacityIQ Web user interface. Once the VM finishes booting, you'll see a basic configuration screen, where you can set the network and time-zone information. If your network uses Dynamic Host Configuration Protocol, the appliance will automatically get an IP address. Otherwise, select Configure Network to set an IP address. It's also important that the CapacityIQ server, hosts and vCenter Server have the correct time to prevent any conflicts with the reporting, time stamps and dates in the dashboard. Before you register CapacityIQ with a vCenter Server, consider which VMs and clusters to monitor. This step is important for licensing compliance. CapacityIQ is licensed in 25-VM increments, and the vCenter Server user account tied to CapacityIQ's registration defines the scope of reporting analysis. In other words: If you have 100 VMs on a vCenter Server and the administrative account can access all of them, the 100 VMs will be visible to CapacityIQ. These permissions are necessary to register and configure CapacityIQ. Manage custom attributes, for example, allows a user to add and edit the extra fields to vCenter Server's forms and views. Extensions allow users to create, modify and remove vCenter Server plug-ins. And Storage View is a plug-in that allows vCenter Server to displays storage-specific information about VMs. The final step is to link CapacityIQ to vCenter Server. Go to the Setup tab in the capacity planning tool's Web user interface. Click the Register button and enter the vCenter Server's IP address, host name and credentials to log in. 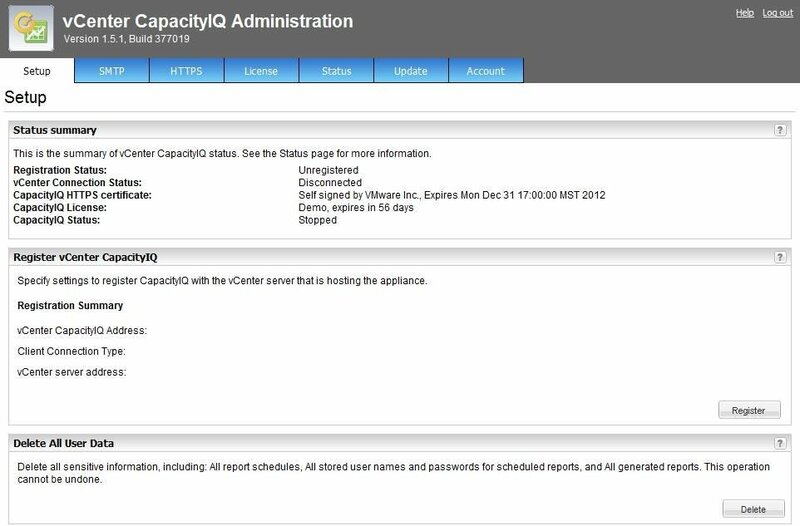 You can control CapacityIQ from the vSphere Client through a plug-in. After registering CapacityIQ with vCenter Server, restart the vSphere Client for the plug-in to appear under the Solutions and Applications tab. To verify that the plug-in is installed and enabled, select Plug-ins > Manage Plug-ins, and CapacityIQ should be listed. Don't forget to apply your license keys, because the default license is good for only 60 days (although it does cover an unlimited number of VMs). The next tip in this series covers how to use CapacityIQ.